Welcome to the Hutcheson Memorial Forest Center! 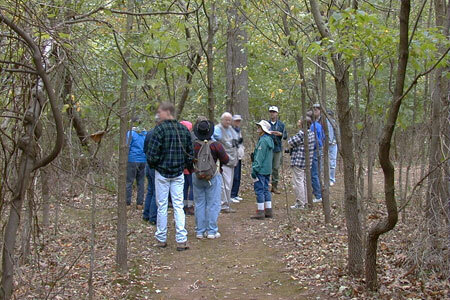 The HMF Center is a unique site consisting of one of the last uncut forests in the Mid-Atlantic, as well as surrounding old fields and young forest. With more than 200 hectares of land under conservation, the HMF Center is devoted to protection of the old forest and research aimed at advancing ecological understanding. Protected and administered by Rutgers University, the Hutcheson Memorial Forest Center consists of the 26 ha Mettler's Woods, the primeval, mixed oak forest, which is one of the last uncut stands of this sort of forest in the United States. This old growth forest is the only uncut upland forest in New Jersey, and appears on the National Park Service Register of Natural Landmarks. The old forest is surrounded by more than 200 ha of young forest, abandoned agricultural fields undergoing plant succession, and a series of long-term research plots. 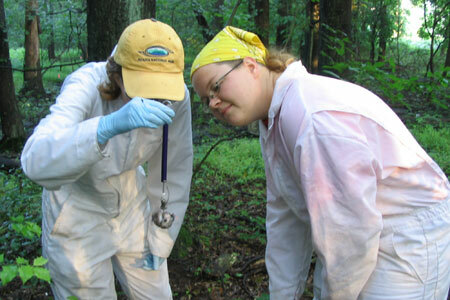 With more than 250 associated scientific publications, the forest and surrounding land is one of the most intensively studied areas in North America, and is known worldwide for long-term ecological, botanical and zoological research. The long-term studies of birds and of vegetation change after agricultural abandonment, which have now been conducted for more than 60 years, are some of the longest running studies of this kind, anywhere. We invite you to explore this unique and rich history of land conservation, ecological research, and education of the HMF Center cataloged here or in person on our next tour!